On the last post, A Lurker suggested having guest artists this week, like when the little kid Billy draws The Family Circus for the dad. People seem to be spontaneously doing this. Look!This is by Juliet’s girlfriend Louise, who just happened to make it yesterday for Juliet’s birthday. How handy. And NLC just submitted this staggeringly brilliant one, in keeping with the zen theme. Dang, I wish I’d thought of it. Hurray for the Zen strip! I’m gonna print it and put it up on the fridge. You oughta just submit that to the broadsheets! People would reflect on it in later generations as late capitalist dada. And your characters can quibble about it in the next issue! 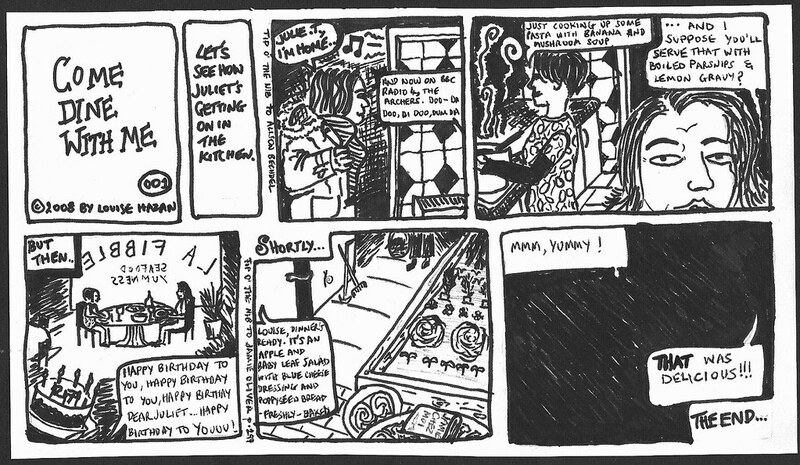 Oh dear, my ‘Come Dine With Me’ strip wasn’t really made for public consumption by the discerning eyes of DTWOF fans around the world (or the great AB herself). So, to give you a little context, I should point out that Juliet’s cooking style is a little – how shall I put it – ‘random’ at times. For her birthday yesterday I bought her a very lovely cookbook by Jamie Oliver to ‘nudge’ her towards trying some slightly more conventional and delicious recipes. This happens to coincide with the creation of the brand new vegetable bed in our garden, so we will hopefully we picking our own organic veg this summer. Within no time at all I hope that Juliet will be rustling up some delicately-balanced and subtlely-flavoured dishes. Mmm, can’t wait. p.s. to be fair, she hasn’t yet served up pasta with banana-mushroom soup, although when she read the strip she did say ‘Lemon gravy? WHat’s wrong with that, it that sounds lovely’! Oops! Look at the time. Coffee break’s over! Back to work, Alison! Peace out, namaste and write on! Wow, makes me wish I drew tributes to dtwof so I could submit one. I’m sure, somewhere, there is a recipe for lemon gravy – in fact, I think I’ve had it and it was nice. Hey, there’s recipes for everything: I’ve even seen one for stuffed porpoise somewhere. The Zen one is a masterpiece and Julie & Louise, I fully appreciate the Archers/Jamie @ Home reference! I, for one, would much rather have lemon gravy than blue cheese dressing. K.B., instead of apples and baby greens with bleu (blue?) cheese dressing and poppyseed bread, how about the baby greens with apple, bleu cheese and raisins and a poppyseed dressing? that’s one of my favorites! lemon gravy would be good with chicken, I think. maybe with a dill garnish? mlk! I am totally making a dill sauce with lemon to put over salmon (hopefully grilled, if it gets above 50 here in Minnesota) next week. It’s from a Deborah Madison cookbook, I think. So, if one says lemon sauce=yummy. Lemon gravy=weird. Funny. Embarrassed: Good luck with the nudging. The garden should help, and be quite fun! See! Lemon gravy is just a different way of saying lemon sauce…I feel vindicated. and hurrah for totally UK specific references. Who’s singing along to the ‘dum di dum di dum di dahh’? and apparently I’m a cowboy…. I read the om mo om mo as “homo” “homo” since in French, the h is silent, and also because I know my incantations not. Anyway, it just goes to show how minimizing always makes for large ranging interpretations. Great stuff, more D2WO4 fanfic please! … I could go on, but I’d better not. 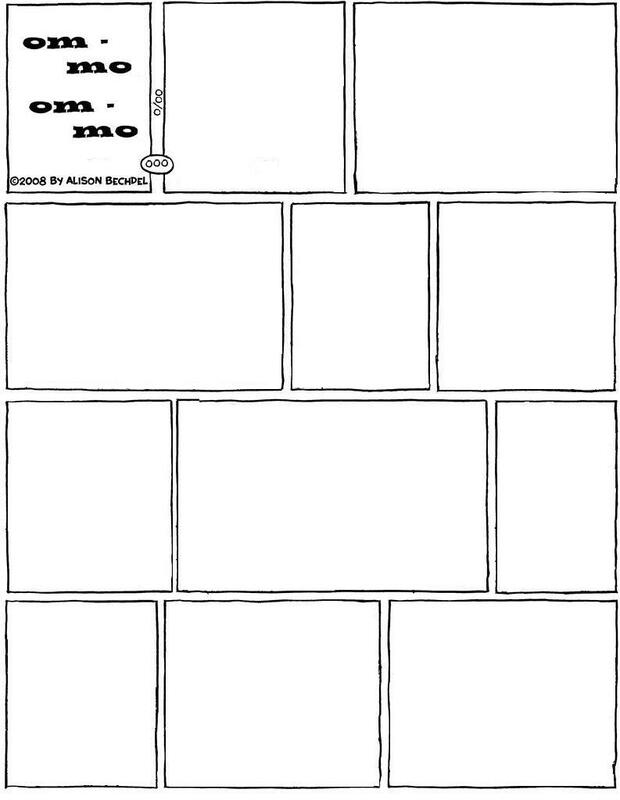 I’m blown away with how the background of panel 5 in the “Om Mo” strip presages the foreground action of panel 7. And the expressions in the final panel are priceless. Y’know, plantains fried with garlic and chilis wouldn’t make a bad pasta, especially if you were carbo-loading. Been meaning to send you one of my daughter’s strips… she’s been venturing into cartooning… only they aren’t dykes to watch out for, they’re, uhm, beings of some sort… I’m not sure. your strip is great… and even without your explanation it was clear that your partner is a bit of a culinary inventrix. Best wishes to all dtwofs. That’s Maoist Orange Cake, not Red. For this lapse, Comrade Full Batch is to be sent down to the country for re-education in baking and fingerpainting. Any further Orangeist political discussion is to be held at the MOC, where there happens to be a new post up involving sharks. Saith the Chairman: Where the citrus does not go, the scurvy does not vanish of itself. Jana–Nice take-off on “Where the broom does not go,the dust does not vanish of itself.” I quoted that,as well as the one below by Che Guevara,when my late husband was remiss in his cleaning chores. It usually worked. “Over-cleanliness is borgeois. Sanitation is a revolutionary necessity.” — Physician and revolucionario Ernesto “Che” Guevara,commenting on the slovely ways of his companeros in las Sierras de Cuba antes de la revolucion popular. Totally off-topic, but my English professor handed out a list of ‘good books you’ll probably enjoy’ to us on the last day of class, and Fun Home was on it… I didn’t even think you could get it in Ireland. i totally support your taking the time that you need. you don’t have to justify it. you’ve done a lot, and give consistently. … the strip does provide a certain comfort and continuity. judybusy~in keeping with the culinary theme here, could you post a link for the dill sauce for grilled salmon? or if it isn’t too complicated just the main ingredients? Thank you! Dum di dum di dum di diddley dum di diddley dum. Dum di dum di dum di dum, dum di diddley dum. Pam, you’re supposed to be in mourning for Ken – is that why you’re so tetchy over the Archers theme? A copy of Om-Mo for my fridge, and a copy for our notice door in our shop. I wonder will anyone try and fill it in? I’ll be sure to talk knowledgeably about the artist’s technique! Alison, I’ve been told you’ll be giving a reading in Ireland in 2009. Is there any substance to this? ummm…. Omo is loading as blank…hmmm.